Can Zambia save its environment with marijuana? Location: On my cloud, where else? For decades, Zambia has staked its economic fortunes on copper mining. But when voters in this southern African nation go to the polls in January to select a new president, at least one candidate will be looking to send that tradition up in smoke. 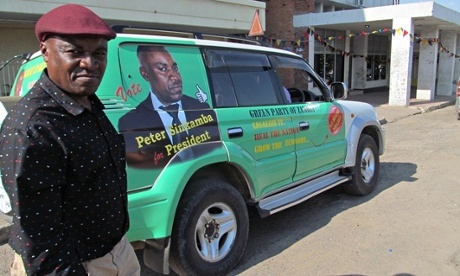 On Friday, Peter Sinkamba will announce his candidacy on the Green party ticket to replace the late President Michael Sata, who died on 29 October from an undisclosed illness. Sinkamba, regarded as Zambia’s leading environmentalist for his battles against the country’s big copper mines, is running on an unlikely platform, especially in this socially conservative nation: legalising marijuana. His plan, first announced in April, calls for cannabis’ legalisation for medicinal use in Zambia, which would be a first in Africa. The surplus crop would be exported abroad, earning Zambia what Sinkamba claims could be billions of dollars. At stake is an opportunity to diversify Zambia’s economy while beginning to clean up the environmental degradation left by close to a century of intensive opencast mining. Copper has long been Zambia’s national treasure, having fired the country to middle-income status in the 1960s and 70s. But by the late 1990s, tumbling copper prices sent the country’s mining income to its lowest levels since independence from the UK in 1964. Mining has since rebounded. In 2012, copper exports amounted to $6.3bn (£4bn), or nearly 70% of Zambia’s total export market. But many Zambians now find their country’s dependency on copper stifling. Local communities suffer from environmental impacts like toxic sulphur dioxide emissions from refineries. In an interview with the Guardian in his hometown of Kitwe, the Copperbelt’s largest city, Sinkamba said his marijuana proposal would wean Zambia off its addiction to mining by prioritising its fledgling agricultural sector. Sinkamba reckons that Zambia could capture up to 10% of a global marijuana market – estimated at $140bn by the UN in 2005 – which would make it more lucrative than copper mining. In a shadow budget released earlier this year, the Green party claimed marijuana exports would boost GDP by over 68% by 2021. Experts on the international drug trade, however, caution that Sinkamba’s scheme might be half-baked. According to John Collins, an international drug policy researcher at the London School of Economics, the export of marijuana for recreational use would run afoul of the 1961 UN single convention on international narcotics control. Nor would marijuana exports necessarily be all that profitable, added Jon Caulkins, a cannabis expert at Carnegie Mellon University, who pointed out that it would take less than 10,000 acres to grow all the THC (the main constituent in marijuana) consumed in the US. Zambia has about 87.4m arable acres. However, Collins called Sinkamba’s plan “entirely doable” if he can take advantage of loopholes that exist in international drug law for medicinal drugs. Israel, for example, last year considered a plan to export medicinal marijuana to the Czech Republic, but shied away out of concern that becoming an international drug dealer would look bad politically. “I think the key for Zambia is that they may view the economic returns from the industry as outweighing political concerns which would limit countries like Israel going too far down this route at the moment,” he said. In any case, Sinkamba is a dark horse in the election. But he insists that his proposal has struck a chord with a disillusioned, and very young, electorate. Re: Can Zambia save its environment with marijuana? Dominoes falling all over the world..